Nestled on a cosy side street close to Greenwich park you’ll find The Fan Museum, the very first of its kind in the world. Opened in 1991 by Hélène Alexander MBE, the museum is spread across two eighteenth-century terraced houses and boasts an impressive collection of around 6,000 fans, ranging from the 11th century to the present day. As I was walking around, I had the pleasure of meeting Mrs Alexander, who comes in every day to ensure everything is spick and span, and to chat to the museum’s visitors. When I asked about how Mrs Alexander started her collection, she remarked that she had always been drawn to fans because in truth, there is a fan for every occasion, mood, and place. The museum showcases her own personal collection as well as The Fan Museum Trust’s Collection, made up of donations, bequests and acquisitions. The new semi-permanent displays are housed on the second floor of the museum via the original eighteenth century staircase, which houses an arrangement of European and Eastern unmounted fan leaves and fan shaped paintings. The first room (image 3) focuses on the two ‘golden ages’ of fan-making in the eighteenth and latter half of the nineteenth century, and the second room on fans from the East. The first room was arranged thematically and documented two periods when fan-making flourished across Europe and fans became a symbol of one’s wealth and status. What I found especially interesting in this section was the depiction of fashionable events or places on fans, such as King George III and his family on a visit to the summer exhibition of 1788 at Royal Academy of Arts, or the promenades of Bath (image 4), in which fashionable ladies and gentlemen can be seen conversing and being carried in Sedan chairs by armies of footmen. 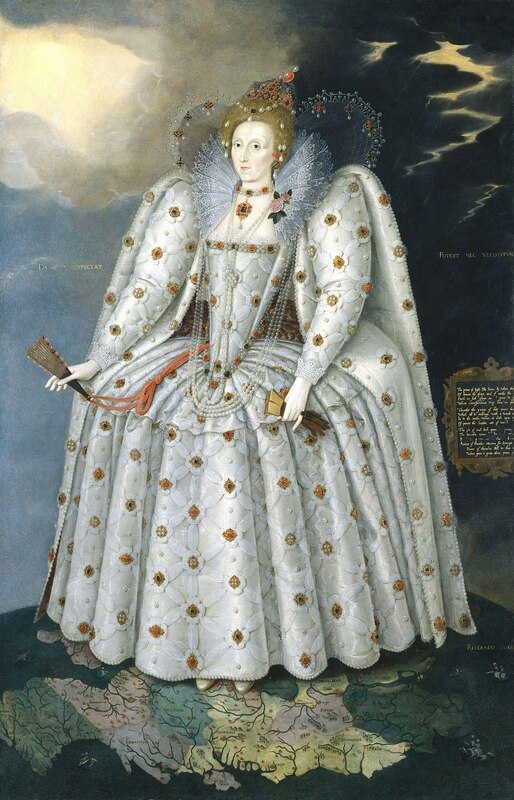 Fans which depicted such places and events, through association, placed their owners within the echelons of high fashionable society and was an indication of their status and wealth. 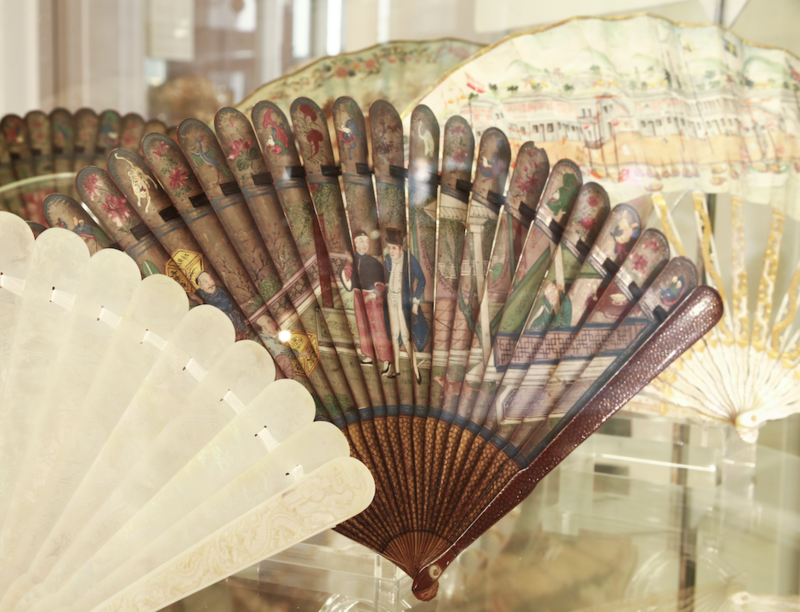 The second room featured both traditional fans from Japan and China (image 5) and fans that were specifically made for export. By looking at examples of traditional fans, one really understood the cultural importance of the fan in China and Japan, for example in Kabuki and Noh theatre, and the ceremonial roles fans played within the imperial court. What I found striking about this room was the difference between the traditional fans and the fans made for export to the West, in which the maker had adjusted the design and colour palette to suit western tastes. By the beginning of the eighteenth century, trade between China and Europe was well established, with the port of Canton being the principle trading port. In fact, one fan even depicts the Hongs (thirteen factories) of Canton, the international trading posts of countries including Great Britain, France, and the Netherlands, whilst another example shows a western merchant deep in conversation with his Chinese counterpart (image 6). My tour of the Fan Museum ended with a trip downstairs to the basement, where the Museum holds fan-making workshops on the first Saturday of every month. I got the opportunity to handle several fans from the museum’s study collection and found the whole experience fascinating, newly-armed as I was with a host of knowledge about this special accessory. I can only describe The Fan Museum as a delight. The whole museum is seemingly built on a labour of love, and an endless fascination for a deceptively simple object capable of remarkable beauty and unique social values. 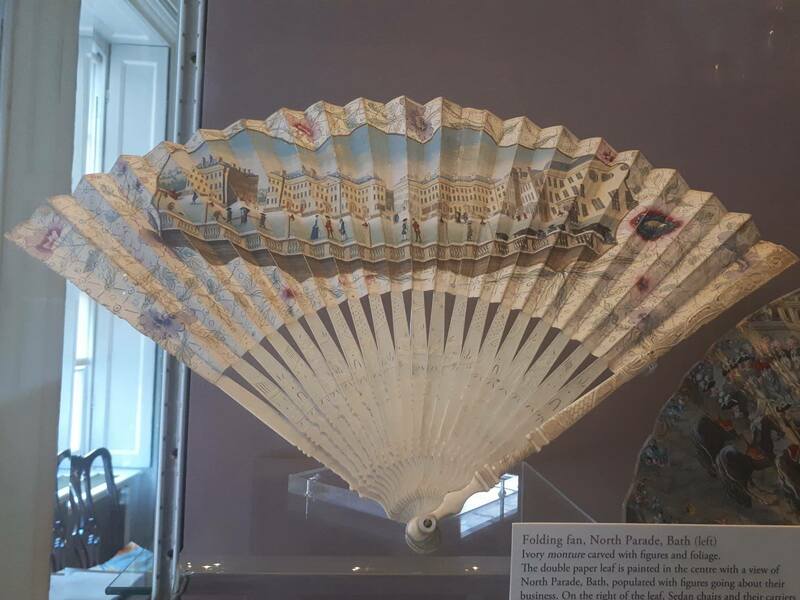 Guided by founder and director Mrs Alexander, curator Jacob Moss, assistant curator Scott Schiavone and a group of volunteers, The Fan Museum manages to be as impressive as it is charming. It also remains accessible to those who have never considered themselves fan-lovers - I came in knowing almost nothing about the history of fans and now, not only am I equipped with plenty of knowledge, but curious and hungry for more. I am, as you might say, a ‘fan’. 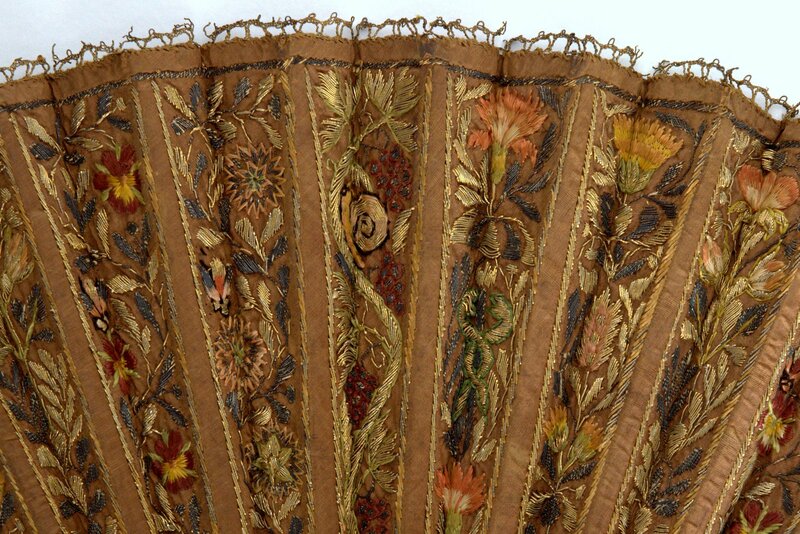 Detail of Elizabethan fan, silk leaf with embroidery, ca.1590s. Upper Floor Galleries, Room 1, The Fan Museum, Greenwich. 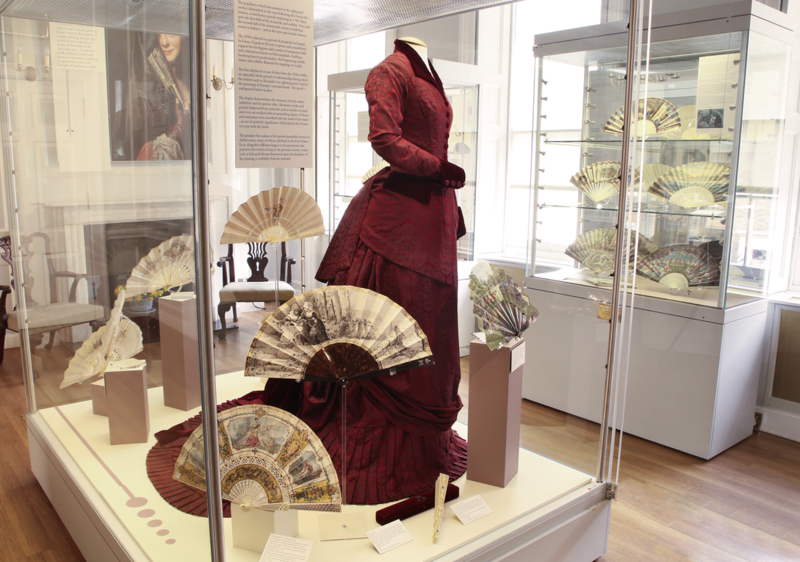 Upper Floor Galleries, Room 2, Traditional Chinese and Japanese fans on display, The Fan Museum, Greenwich.